Have you heard of Lanmodo portable car canopy and thinking of switching over to it but do not know some of the features that made it better than the traditional car canopy? You are not to worry as this is where you are going to get detailed information about this tech improved car canopy. 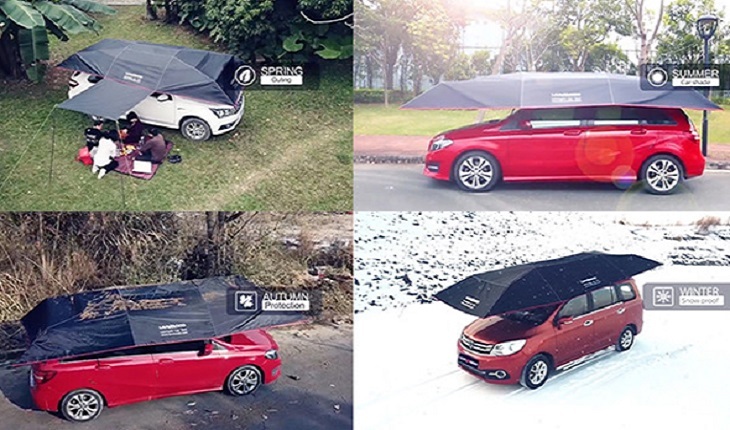 You will also get more information about the functionalities and the uniqueness of this car cover that made it one of the most popular in the entire world. Among the seven features of the Lanmodo portable carport canopy that made it better than others, the automatic feature and functionality is among the main one. The automatic feature of this carport has made it easy to use even by a little child. Just a press on a button you will open or fold down the umbrellas for perfect protection and coverage. Another great feature that made the Lanmodo portable car canopy garage better than others is that it is designed with middle side that suite various car types. For that reason, you are not just going to use it for your SUV or sport car but can equally use it on your bus, wagon, sedan and other kinds of car. The portable and middle size of this is among the things that made it perfect for any kind of cars. So, you need not even buy more than one to ensure absolute protection of your entire cars one after the other. You are thinking of a car cover that will also serve the purpose of outdoor protection for your family outing, Lanmodo products simply have you covered. Just buy one portable car shade canopy made by Lanmodo and it will equally serve the purpose of outdoor umbrella. You can even use it for your beach party, camping ground and other outdoor activities without any kind of issues. Apart from the fact that Lanmodo car cover is built for suitable car coverage it is also designed for to be used as camping tent. In fact, all the things you need on your camping tent are made available in the Lanmodo product. That means you will enjoy multipurpose feature when you buy Lanmodo car product. With the automatic functionality, setting up the Lanmodo car cover as camping tent is not a difficult thing. That is why you should consider going for this product when you want one car cover that can serve several purposes for you. Your outdoor event will be made complete when you make use of the Lanmodo portable car canopy for your coverage. This is due to the complete outdoor power resources made available in Lanmodo product. With the USB connection port, you will be able to connect your torchlight to illuminate your outdoor surroundings for suitable camping experience. You can also stand chance of charging your phone while enjoying yourself in the outdoor party when you make use of this car cover made by Lanmodo. Another feature you should know about Lanmodo car cover that made it better than other ones out there is that it is made suitable as canopy garage in winter. With the help of this portable car canopy garage you are going to be sure of enjoying overall coverage and protection over your car from hail, snow and other things that come with harsh winter weather. That means your car will not be affected with effect if harsh weather when you have Lanmodo car cover over your car. Even when you are not in the winter season, you still stand chance of enjoying absolute protection from several elements. Hot summer weather will never be a problem for you when you have Lanmodo car cover on top of your car. Your car will also be protected from bird dropping, heat from the sun, leaves, acid rain, dust and other elements that comes with several season.